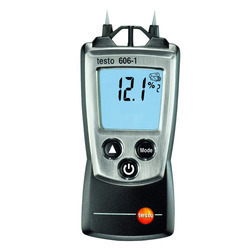 We provide a wide array of wood moisture meter, which is used to measure the amount of water in wooden object. These meters are also used for measuring moisture levels of building walls, plaster etc. The Edgetech Instruments Model PPM1 is a trace moisture analyzer designed specifically for monitoring moisture levels in dew point and PPM units. This trace moisture analyzer utilizes an electro-chemical (P205) sensor in combination with a proprietary semi permeable diffusion membrane.